Bengaluru, 13th February, 2017: Air India SATS Airport Services Pvt. 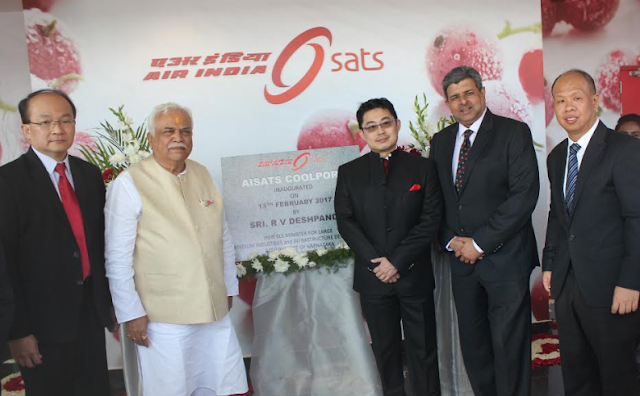 Ltd. (AISATS), India’s premier airport services company, launches “AISATS COOLPORT”, India’s first integrated on-airport perishable cargo handling centre, at Kempegowda International Airport, Bengaluru (KIAB). The 11,000 sq. meter state of the art facility built at a total project cost of INR 48 crores, was inaugurated by Sri. R.V. Deshpande, Minister for Large & Medium Industries & Infrastructure Development, Government of Karnataka. In the past few years, Indian air cargo industry has seen tremendous demand for handling of perishable cargo products. The launch of AISATS COOLPORT will meet the extensive handling requirements of perishable cargo products such as pharmaceuticals, fruits, vegetables, flowers, meat and sea food, through its future ready infrastructure with capability to handle 40,000 tons per annum, customized cold storage solutions comprising of 17 dedicated cold rooms with temperature ranging from -25 to 250C, Refrigerated Queue Lanes with a temperature range of 2 to 80C for unitized shipments and end-to-end cold chain solutions including refrigerated trucking service, indigenously developed cool trolley and thermal blanket, as well as temperature controlled container handling. “We aim to be the engine of economic growth for the region by connecting Bengaluru to the world and positioning the city as the Gateway to South India not only for passenger traffic but also for cargo. BIAL has a robust plan and strategic intent to grow the cargo business. Our aim is to create an environment that enables our cargo partners to introduce new initiatives and facilities that cater to the burgeoning cargo demand of this region. We firmly believe new logistics that redefine the cargo business will propel us closer to our vision of being the Cargo Hub of South India and the region. I, congratulate AISATS on the inauguration of the Perishable Cargo Handling Centre. This is a validation of our partnership and commitment by both BIAL and our partners to continue to explore new ways for enhancing efficient and seamless cargo operations.” said Mr. Hari Marar, President, Airport Operations, Bengaluru International Airport Ltd. The trial operations of the AISATS COOLPORT, from October 2016 through January 2017, witnessed a 27% growth in the perishable tonnage in comparison to the same period last year. During the tenure of the trial operations, 4,653 tonnes (import and export) of varied temperature sensitive and perishable cargo was effectively handled by the AISATS COOLPORT. Apart from being a specialised warehousing unit, AISATS COOLPORT is also a one-stop-shop comprising of customs clearances, state-of-the-art Drug Controller lab and Plant Quarantine Inspection & Certification office, to expedite the import and export procedures. AISATS COOLPORT recently obtained its Good Distribution Practices (GDP) certification for receiving, handling, storage and dispatch of pharmaceutical and perishable cargo as per WHO standards. AISATS also aims to achieve HACCP and IATA CEIV certifications in the near future, which will promote better trade facilitation and enhance the State of Karnataka’s position as pharmaceutical and perishable hub of India. AISATS is a 50:50 joint venture between Air India Limited, and SATS Limited, a leading gateway services and food solutions provider in Asia. As part of the Indian Government's initiative to upgrade its airports to world-class facilities and attract more airlines to fly into India, AISATS was formed with the vision to provide world-class airport services in ground and cargo handling that exceed customers’ expectations. Since the start of its operations in 2008, AISATS has provided hassle-free and comprehensive solutions to its customer airlines in international airports at Bengaluru, Delhi, Hyderabad, Mangalore and Trivandrum. Currently employing around 11,600 staff, AISATS offers end-to-end ground handling services such as passenger and baggage handling, ramp handling, aircraft interior cleaning, load control and flight operations, and cargo handling services for general, perishable, transshipment, express courier and special cargo.